Port Severn is a popluar spot for cottage seekers - it is convenient to Toronto, being an easy drive via highway 400. It offers great boating, whether your preference is the Trent Severn Waterway or the open waters of Georgian Bay and it oozes with all things cottage country. Tucked neatly on a dead end road is where you'll find Slip Away. As usual, we couldn't resist a little word play in our name for this cottage - Slip Away is located close to a Marina which, while it could serve your boating needs, may not be required since you have your own private dock and waterfront to use. The cottage is cute and comfy. There is an open-concept living/dining/kitchen area, and the bedrooms and bathroom are set in behind them. The living room has a wood stove for cool nights and satellite TV for rainy day and evening entertainment. 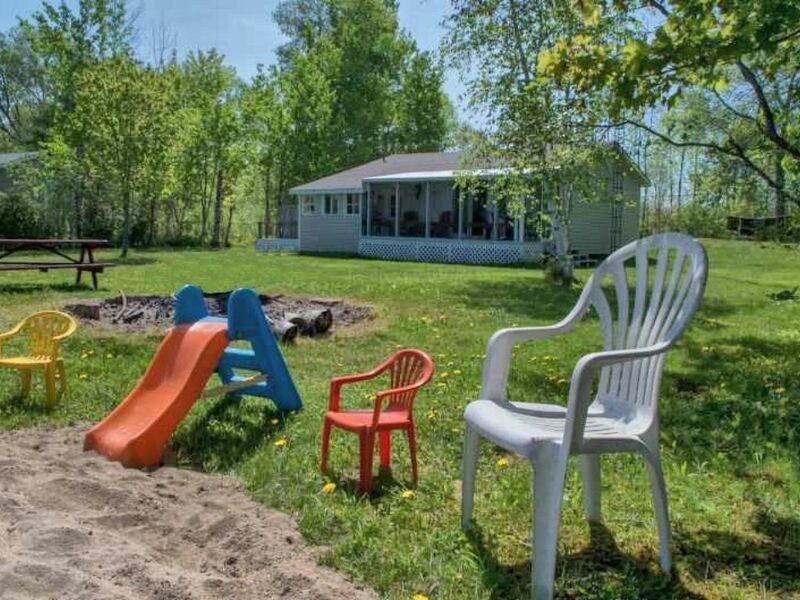 The yard has plenty of room for outdoor entertainment. A generous sized grassy area is great for throwing a frisbee or football, a game of tag or whatever seizes the imagination. There is a small beach area for children with a sandy shallow walk in.